Eighteen percent of federally-eligible children received subsidized care through CCDF or related government funding streams in fiscal year 2009. This number is based on estimates of the number of children eligible for child care under federal eligibility parameters and the number of children receiving subsidized care. Figure 1 shows a breakdown of federally-eligible children by age and poverty status. Some children were more likely to receive services than others. Eligible children from the lowest-income families were the most likely to receive child care assistance. Roughly 39 percent of federally-eligible children from families with incomes below 100 percent of poverty and 24 percent of those from families with incomes between 101 percent and 150 percent of poverty were served (see Figure 2).7 By comparison, 5 percent of federally-eligible children from families with incomes greater than 150 percent of poverty were served. In the case of families with one adult and two children, eligible children from families with incomes greater than 150 percent of poverty would include those from families with an income greater than roughly $25,900 (about $2,200 when measured monthly) but less than 85 percent of their state’s SMI. 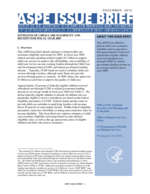 Figures 3a and 3b show that federally-eligible children between ages 0 and 4 were much more likely to receive subsidized care than eligible children older than age 5. In 2009, 27 percent of federally-eligible children ages 0 to 4 were served (including 15 percent of infants, 29 percent of children ages 1-2, and 30 percent of children ages 3-4). By comparison, 14 percent of federally-eligible children ages 6-9 and 8 percent of federally-eligible children ages 10-12 received subsidized care. Figures 3a and 3b also show differences in the proportion of federally-eligible children served by family income and age.